i’m not sure how simple it would be to add an extra column to the recipes’ lists but it would make a big difference in the way we browse for recipes. A lot of times i’m trying to figure what can i make with different random flavors i have. So i search that flavor and open its profile. From there i usually identify the average single flavor percentages for that flavor and other notes, i see what is most commonly used with and most importantly, i see the recipes. Now here, i usually start by ordering the recipes by rating, but to know if i have the ingredients to make it or how many i am missing i have to open the link for that recipe when it would be much simpler and effective if there was a column saying how many ingredients it takes, of which how many i miss. With this change, the recipes would have as columns the recipe name, how many ingredients and in brackets how many of those we are missing, time and rating. This way it’s much faster to browse recipes and decide what am i going for when, for example, i’m placing an order on the internet for flavors and want to make quick decisions. Thanks for reading this suggestion and what do you think about this? Granted it doesn’t provide the functionality of validating against your flavor stash. I assume that the features you are asking for would cause quite a bit more computational demand on the system(s) hosting the ELR site since it would have to do more cross-checking against the database, but that may or may not pose an issue to providing them, so a moderator will probably need to weigh in on the technical front. 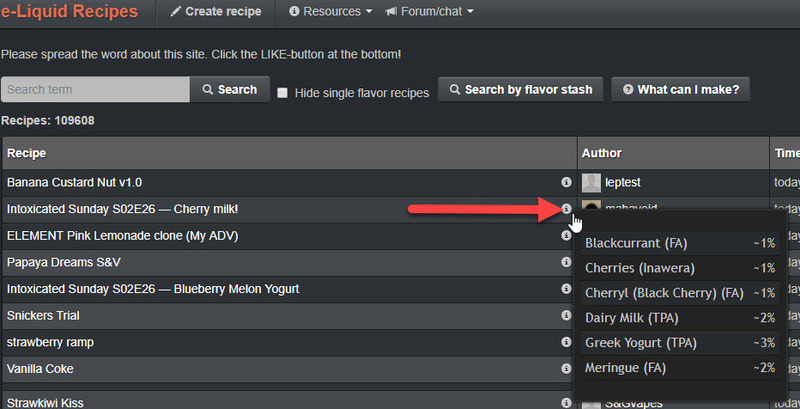 Assuming you have already created your flavor stash, have you tried the What Can I Make button? It’s located right on the main recipes page.